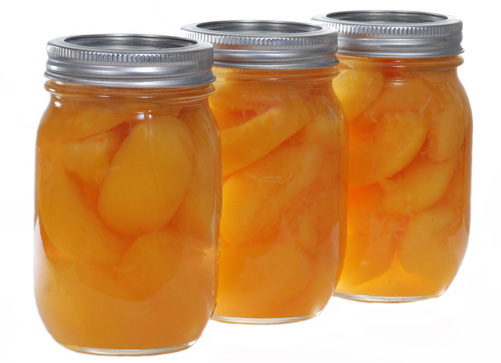 Quantity: For each 7-quart canner load, you need an average of 17-1/2 pounds of fresh nectarines. For each 9-pint canner load, you need an average of 11 pounds of fresh nectarines. 2. Wash fruit, cut in half and remove pits. Slice if desired. 3. To prevent browning, slice peaches into a mixture of water and ascorbic acid. 4. Prepare and boil a very light, light or medium syrup, or pack nectarines in water, apple juice or white grape juice. 5. Hot pack or raw pack according to instructions below. Note: Raw packs make poor-quality nectarines. Place drained fruit and syrup, water or juice in a large saucepan and bring to boil. Fill jars with hot fruit and cooking liquid; leave 1/2-inch headspace. Place halves in layers, cut side down. Fill hot jars with raw fruit, cut side down and add hot water, juice or syrup, leaving 1/2-inch headspace. 7. Process in a boiling water or pressure canner according to the recommendations. Let cool, undisturbed, 12-24 hours and check for seals.